If you are planning your travel to DC or are already in DC, you will encounter traffic, traffic and more traffic. Maryland, Northern Virginia and Washington DC has some of the worst traffic recorded on the east coast of the United States. Many people, whether visiting or commuting, thousands upon thousands each day, choose to take the DC Metro, which is overseen by Washington Metropolitan Area Transit Authority or WMATA for short. By taking the Metro, you can save time and money, going underground where there is no traffic and paying fares of $2-$5 compared to $10-$20 taxi, Uber, or Lyft rides. Metro provides safe, clean, reliable transit service for more than 600,000 customers a day throughout the Washington, DC area. The system is the second busiest in the United States, serving 91 stations in Virginia, Maryland, and the District of Columbia. 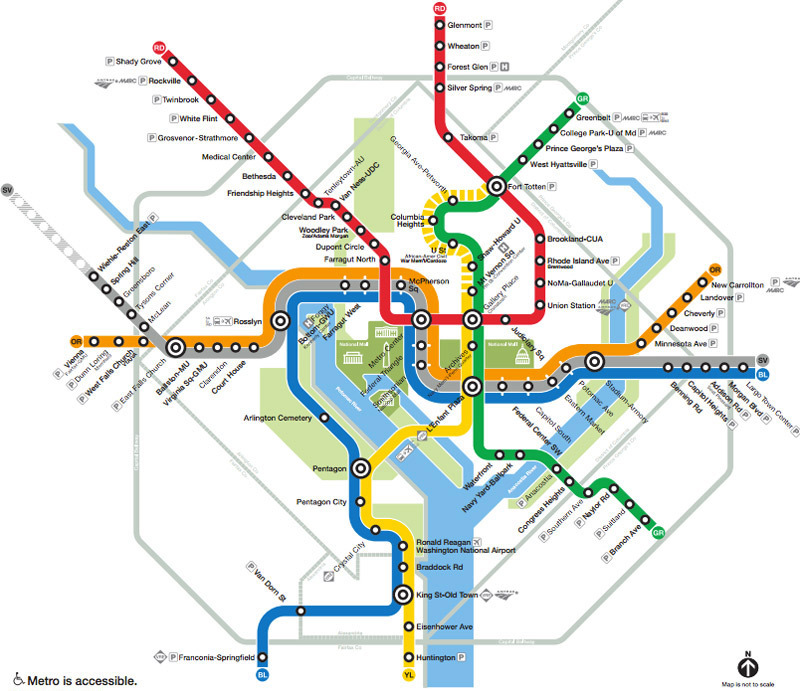 The Metro system has six color-coded rail lines: Red, Orange, Silver, Blue, Yellow, and Green. The layout of the system makes it possible to travel between any two stations with no more than a single transfer. The Red Line is where our DC B&B is located. The Red Line starts in Shady Grove Station Maryland and ends in Glenmont Station Maryland. DuPont Circle, Farragut North, Metro Center, Gallery Place Chinatown, Union Station and Silver Spring are some of the most popular stations on the Red Line Metro. The Orange, Silver and Blue Metro Lines follow much of the same paths in Washington DC but go their own direction once you get to Rosslyn Station and Stadium Armory. The Orange Line starts in Vienna, Virginia and ends in New Carrollton Maryland. Falls Church, Rosslyn, Metro Station, L’Enfant Plaza, Capitol South, and Eastern Market being the most used stations. The Silver Line starts in Reston, Virginia and ends in Largo, Maryland with Tyson’s Corner, Rosslyn, Metro Station, L’Enfant Plaza, Capitol South, and Eastern Market being the most used stations. The Blue Line Metro Starts in Franconia-Springfield Station and ends in Largo, Maryland. Some of the big stops along the Blue Line are stops in Alexandria, VA, Pentagon, Arlington Cemetery, Rosslyn, Metro Station, L’Enfant Plaza, Capitol South, and Eastern Market. The Yellow and Green Line are the sole lines in the DC Metro System that run North and South predominantly, which is a fact that can be helpful to remember. The Yellow Line starts in Huntington and ends in Fort Totten, encompassing stops in Alexandria, VA, Pentagon, L’Enfant Plaza, Gallery Place/Chinatown and Capital Heights. The Green Line starts in Greenbelt Maryland and ends at Branch Avenue Station. This Metro line stops in Anacostia, Archives, L’Enfant Plaza, Gallery Place/Chinatown, Capital Heights and College Park UMD. There are some helpful twitter handles such as @Metrorailinfo and @wmata that you can follow and have access to up-to-the-minute alerts on anything in the Metrorail System. And if you’re interested, there is also a funny twitter handle that you can follow called @unsuckdcmetro which constantly posts about Metro line mishaps.